My name is Angelina and you can find me blogging over at Ruby Jean’s. I LOVE everything from Crafting, Sewing, Diy projects, Antiquing and trying out new recipes is always fun. I am so VERY thrilled to be here today and I look forward to sharing some fun tutorials with you in the future. The Holiday’s are quickly approaching and I know that many of us have the idea of GIFT GIVING on our minds. So today I am going to share with you a VERY simple DIY gift that can easily be whipped together in no time flat. You will first want to choose your fabrics and embellishments. Using one of my pots as a template, I traced and cut out my pattern. I pinned and basted my trim onto one of my pattern pieces, with the batting attached as well. This will just help insure there is no moving when you sew the top piece on. Be sure to leave a small opening for turning right sides out. I repeated the same process 3 other times, each with a different sized pot and different fabric. Press them with a hot iron. At this point you can Top Stitch or Leave them as is. I’m kind of liking them, as is. These little hot pads offer endless amounts of creativity. You can personalize them for special occasions, Birthdays, Weddings, Housewarming’s and even for the Holiday’s. So don’t just sit there!! Get to making some Hot Pads and get your GIFT GIVING on!! Pinterest, Fabcebook, Twitter, or Shoprubyjean.com. Thank you so much Desiree for having me. I am so honored to have Angelina as one of The 36th AVENUE contributors. Her work never ceases to amaze me. 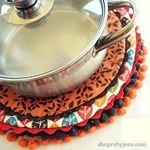 Make sure to follow and check out her projects over at her blog Ruby Jean. Here are some other of her must see work. Angelina’s GORGEOUS Sewing Room. Take a tour here. 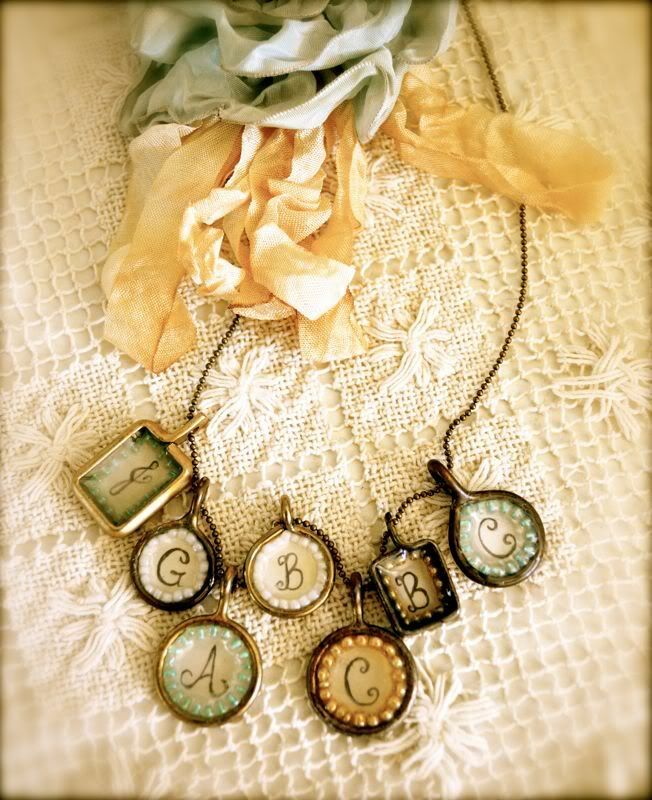 Learn how to make Silhouette Charm Pendants here. And if you love aprons as much as I do, you want to check out her collection here. I am a huge fan of Ruby Jean. Pinterest, Facebook, Twitter, or Shoprubyjean.com. Andrea, I am so sad. I am still can’t get to see your blog 🙁 I am not sure why. Adorable! I have been telling my hubs that I am going to make new ones & keep putting it off with all these other things going on. I am so inspired to get working on them now. Oh my cuteness! I have to make some of these! I am so glad to see Angelina from Ruby Jean here…she is amazing!!! I agree. I love everything she does. Those are really cute! I love them and plan to have a go at making some myself. They would make such a cute Christmas Gift. these are so cute and homey! thanks for sharing!